You have a character var with the string "000112010302". What's the least about of code that can be written to determine what is the highest number (3) in the string? With this entry, FreelanceReinhard defied a natural algorithmic instinct to treat this as a numerical digit comparison problem, and instead approached it as simple pattern matching problem. The highest digit comes from a finite set (0..9). COMPRESS function is often used to eliminate matching characters from a string, but the k directive inverts the action to keep only the matching characters instead. Visit the communities topic and chime in. The post SAS code golf: find the max digit in a string of digits appeared first on The SAS Dummy. Is it time to add SAS to the list of "romance" languages?*. Recently a SAS community member took this to the next level and crafted a marriage proposal using SAS. With help from the SAS community, this troubadour wrote a SAS program that popped the question in a completely new way. Our hero wanted to present a SAS program that was cryptic enough so that a casual glance would not reveal its purpose. But it had to be easy to open and run within SAS University Edition. His girlfriend is a biostatistics student; she's not an expert in SAS, but she does use it for her coursework and research. With over 70 messages exchanged among nearly 20 people, the community came through. A marriage proposal that was helped along by the SAS Support Communities? That's definitely a remarkable event, but it's not completely surprising to us at SAS. 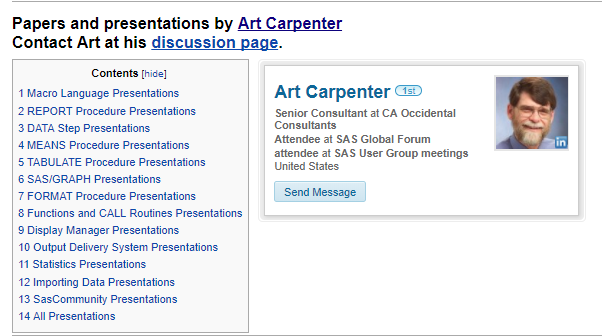 SAS users regularly impress us by combining their SAS skills with their creativity. And, with their willingness to help one another. With Valentine's Day approaching, we thought that it would be fun to prepare some Valentine's greetings using SAS. We've started a topic on the SAS Support Communities and we invite you to contribute your programs and ideas. 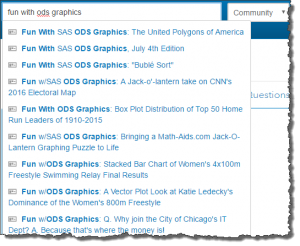 You can use any SAS code or tool that you want: ODS Graphics, SAS/GRAPH, SAS Visual Analytics, even text-based output. Our only request is that it's something that another SAS user could pick up and use. In other words, show your work! It's not exactly a contest so there are no rules for "winning." Still, we hope that you'll try to one-up one another with your creative contributions. The best entries will get bragging rights and some social media love from SAS and others. And who knows? Maybe we'll have some other surprises along the way. We'll come back and update this post with some of our favorite replies. 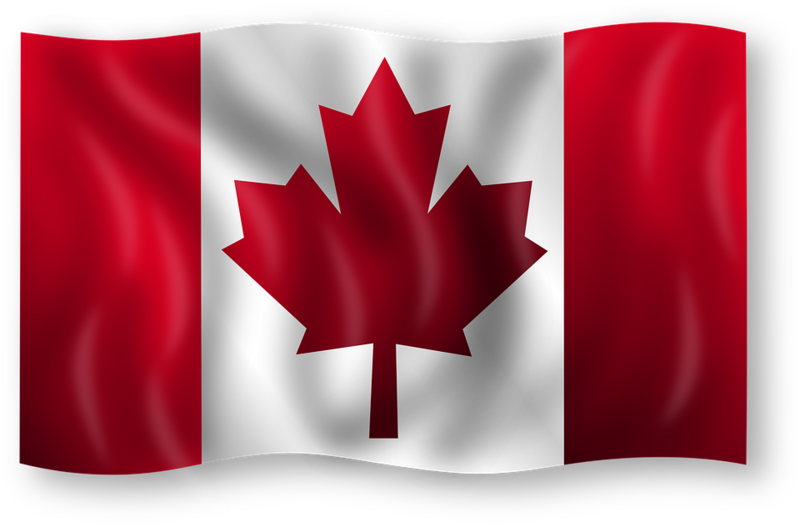 Check out the community topic and add your idea. We can't wait to see what you come up with! * Yes, I know that "romance" languages are named such because they stem from the language spoken by the Romans -- not because they are inherently romantic in the lovey-dovey sense. Still, it's difficult to resist the play on words. 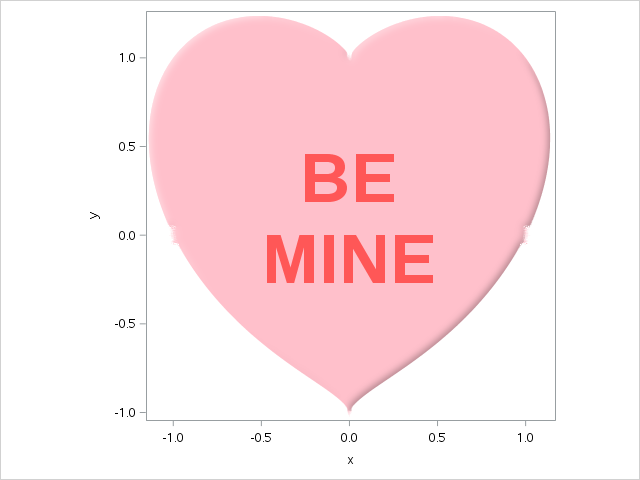 A Valentine challenge: express your <3 with SAS was published on SAS Users. The post How to share your SAS knowledge with your professional network appeared first on The SAS Dummy. SAS releases regular updates to software products in the form of hot fixes and maintenance releases. Hot fixes are SAS' timely response to customer-reported problems, as well as a way to deliver occasional security-related updates that can affect any software product. At SAS we call them "hot fixes." Other companies might call these "updates," "patches" or (the old-timey term) "zaps." I like the term "hot fix," because it connotes 1) a timely release of code, and 2) something that you apply to an established production system (while it's running "hot"). An important part of the hot fix process is learning when there is a new fix available. Beginning this month, we now have a new SAS Hot Fix Announcements board -- on SAS Support Communities -- where you can learn about newly available fixes. 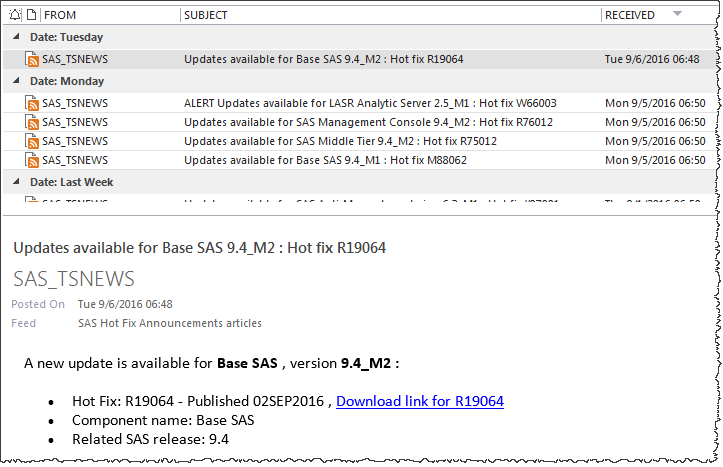 If you're a SAS administrator, these notices provide more complete and detailed information about available hot fixes. And if you are a business user, it behooves you to stay informed about fixes so you can pass information on to your IT department. By using the community board to host hot fix notices, we've now provided you with many options to subscribe to this content. Like any community board, you can click Subscribe and have the notifications e-mailed to you as soon as they are posted. Or you can use your favorite RSS reader to peruse the latest entries when the timing is right for you. Finally, you can use the Search field on the hot fix board to find just the fixes you need. Simply type a SAS product name, a version number, or text from a SAS Note to find the matching hot fixes. Visit this topic on the SAS Support Communities to learn more about how to pull the information you need, or to have it pushed to you automatically. For decades, SAS Technical Support has used the TSNEWS-L mailing list to send brief, weekly summaries of the recent hot fixes. While this is good for raising awareness that "a fix is available" for a product you use, the information in the e-mail contains no details about what issues each hot fix addresses. Nor does it include a direct link to download the fix. For now, this information will still be delivered via TSNEWS-L -- but we hope that you find the community board to be more flexible. It shouldn't surprise you that we use SAS software to help bring you the details about SAS fixes. 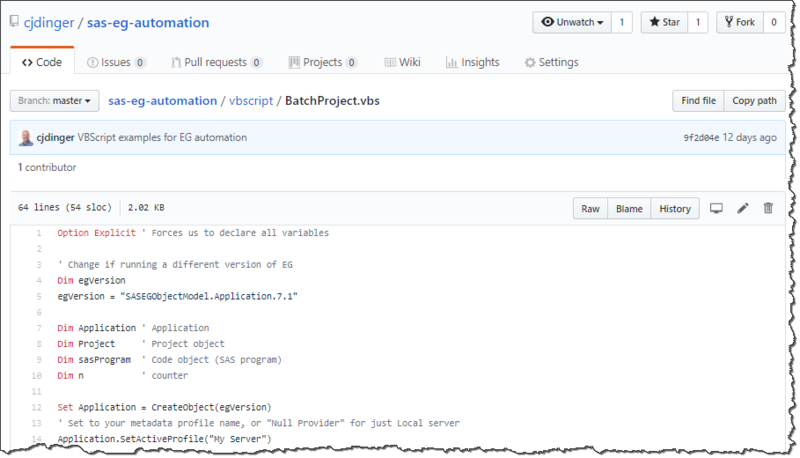 To build these improved notfications, the SAS Communities team and SAS Technical Support worked together to automate the publishing process for hot fix bulletins. All of the hot fix details were already tracked within internal-only operational databases and displayed on the Technical Support Hot Fix download site. 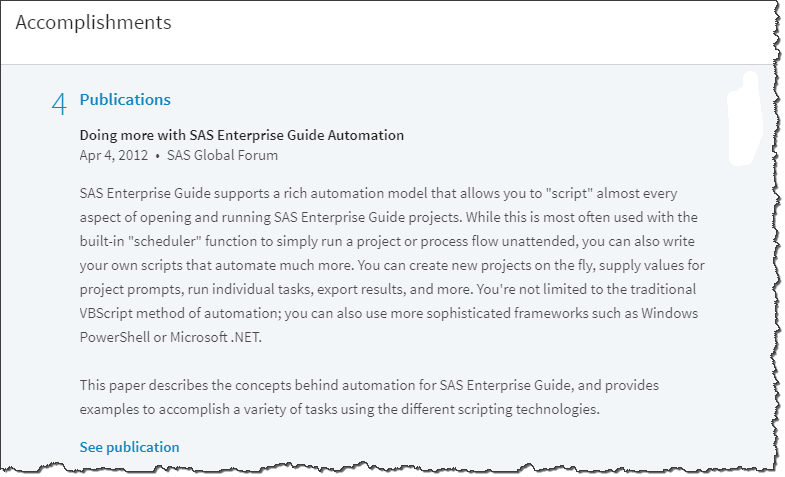 Now, a SAS-based process assembles this data, creates a hot fix bulletin entry for each fix and publishes the entry automatically to SAS Support Communities. It's a wonderful mix of SAS data management, REST APIs, DATA step and more. It's a 300-line SAS program (including plenty of comments) that runs every weekday morning -- and it completes in about 15 seconds. It's time well-spent to keep SAS users in the know! How to stay informed about SAS hot fixes was published on SAS Users. SAS Technical Support has earned a wonderful reputation for being friendly, knowledgeable, and thorough. Every customer that I talk to is delighted by the experience. That's why what I'm about to say might be heresy, but here it goes. If you have question about how to accomplish a task using SAS software, you can probably find your answer faster on SAS Support Communities. With over 50,000 topics already cataloged, the chances are high that your question has already been asked and answered on the communities. And if you need to post a new question, the peer network of SAS communities members represent thousands of experts who can respond to your question immediately. No matter how pleasant the experience, calling customer support is a last resort for many people. Studies show that millennials are much happier when they can solve a question themselves by using a self-serve option (like an online community!). I'm not a millennial (missed that cutoff by a decade or two) -- but I feel exactly the same way. There are additional benefits to using SAS Support Communities. For starters, you'll come to learn who the experts are in your field. By following them and reading their work, you can learn more about questions that you don't even have yet. In addition, many SAS employees read and reply to topics in the communities. For example, you might read an answer about SAS Enterprise Miner from a developer who actually works on the product. That direct line of communication is relatively rare in the software industry, especially for a company like SAS that has so many products and customers worldwide. 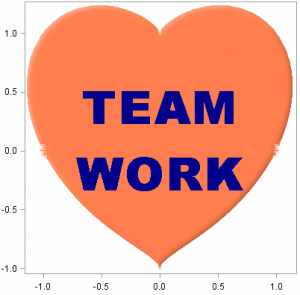 Because we're SAS and we measure everything, we have ways of measuring user success on our communities. First, we can look at the data around the topics viewed. Solved topics make up 30% of all page views on site. Many users who visit the communities site look at just one topic per visit -- the one that solves their immediate issue. That tells me that they found what they needed right away, and then moved on with their lives. The second way we measure success: we ask. In the past few months, nearly 4000 people completed our "Tell us what you think" questionnaire. 72% of survey respondents say they found what they were looking for on SAS Support Communities. That's a solid benchmark that we strive to improve -- but our industry experts tell us that our success rate compares very favorably to other communities sites. If you've used SAS Technical Support, you might be aware of their policies around response times. Support tracks can have different levels of severity, and the more severe tracks have a quicker SLA (service-level agreement, or promised response time.) In practice, most customers experience much faster service than that the SLA policies promise, but that's not guaranteed. While SAS Support Communities don't offer a service-level agreement, they are "open" 24 hours a day, every day, around the world. Our data show that community members respond quickly, often within minutes of your question. 92% of well-phrased questions receive a reply within a day. 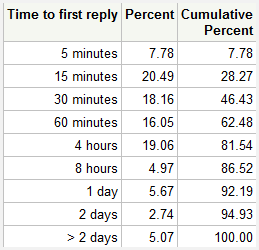 For questions that eventually show as solved, the reply that solves the question arrives in 8 hours -- 72% of the time. Can you see how tapping a community of thousands of experts can expedite your path to learning and to a solution? Share example data. Many questions can be answered properly only when the responders can see the "shape" and characteristics of your data. Don't share anything proprietary, of course. Show what you have tried. Community members love to nudge you towards the proper solution, but it helps if you share what you've already tried and if you hit any walls...explain. If you have special constraints (must use a older version of SAS, product set, etc), share that too. Search on communities site first, before posting a new question. The act of entering a new question helps with this because you'll see the subject line "autocomplete" with suggested matching topics, even before you post. That's another reason that the first tip (precise subject line) is so important. Post into most appropriate board. There are boards for most SAS products, and these are monitored regularly by experts who specialize. Posting on the correct board helps your topic to be seen by the best experts. When you receive a helpful reply, come back and mark it as an Accepted Solution, or at least click Like for the replies that are helpful. This action will help you and others to find the answer in the future. Your peers in the community cannot solve every problem that you encounter. If you're experiencing slow performance that you can't explain, or having installation troubles, or seeing "crashes" -- you probably need to open a track with SAS Technical Support. The support consultants are experts in diagnosing and getting to the bottom of such issues. You'll most likely need to share details and logs that you would not typically share in a public forum. However, the sweet spot of the communities is the "how do I" question -- a syntax, best practice, or simple usage query that you encounter as you learn to use the software. And SAS users never stop learning -- even those of us who have decades of SAS experience. The post How SAS Support Communities can expedite your tech support experience appeared first on The SAS Dummy. There are SAS users, and then there are SAS Super Users in the SAS Support Communities. What makes a communities user "Super"? It's the Super Users that fly around the discussion boards -- answering questions and guiding other community members. They aren't just SAS experts; they are teachers as well, helping new users to "learn to fish" and find their own answers. The SAS Support Communities Super User program recognizes the strongest members for their outstanding contributions. In addition to the public honor of the "Super User" designation, inductees are given tools that help them to expand their community leadership. We hope this helps them get even more out of their community experience. Certainly, their actions help the rest of us in the community as well. "There is a wealth of expertise available for free." "You can participate any time of day or night." "I love when you get an interesting question and multiple people post different answers trying to one-up each other." "It's an opportunity to share. Most of the answers I provide take me very little time to prepare, and I know programmers can struggle as they are learning." Sign in today to SAS Support Communities and see these SAS Super Users at work. And maybe one day, you can become a Super User too! Super Users in the SAS Support Communities was published on SAS Users.